Pyramid Mountain Natural Historical Area offers a strange combination of hiking terrains, camp sites and views. Well known and wisited by the locals, this park does not offer long hiking trails, but due to the varried terrain, they can pose a challenge. Combine it with a few spectacular views and an easy access, and you have a popular outdoor area. Add to it a few less known places, and you have a place to go to. Take the I-287 to exit 44, then drive west to the center of Boonton. Turn right onto Route 511 North and go a few miles. There are very few signs pointing to the park but once you take a quick right and left on the road, start looking to your left. After two roads are laving the 511, you'll come across a small parking lot in front of the park's visitor's center. The parking lot is hopelessly small, so you may end up parking on the side of the main road. Currently, there are three hikes in this section. The first hike is the most common one - to Bear Rock, Tripod Rock and back. The second hike seems to be unknown to most hikers; I've never met here anyone (but that may be because I tend to hike here at sunrise). The third hike is the longest, and especially popular with people with dogs. The hike starts with a nasty ascent. Don't forget to take a free map at the visitor's center. Even though the park is not one of the best marked, it still is way above average, and features one of the best maps I've seen so far. The following hike will be around three miles long, but due to some steep slopes and three stops along the road, the whole trip can take over two hours. Start at the Blue trail. This trail soon takes a right turn and goes steeply uphill,towards a powerline tower. If you forget to turn there and go straight instead, you will run into some houses soon. Once on the top, the trail divides - the Blue trail to the right and the White trail to the left. You will return at the Blue trail, so turn left. The first half of the White trail leads through an open, swampy area below the powerline. I have heard this area is beautiful when the flowers are blooming, but because its openess, it features a rather harsh climate and is not very popular with other hikers. Watch out where you are stepping, as the ground holds pools of water long into a drought. Once the powerline takes a left turn, the trail turnd right. In this area, you are supposed to seethe Ruins of the Morgan Place. The Morgans have had a terrible reputation in the 18th Century, raiding the town of Boonton. However, I could not find any ruins anywhere, maybe you will have better luck. The rest of the White trail is pretty level, with very little to see. That is, until you arrive to the immense Bear Rock. This place is a popular hangout of hikers, and every time I came here, it was crowded. 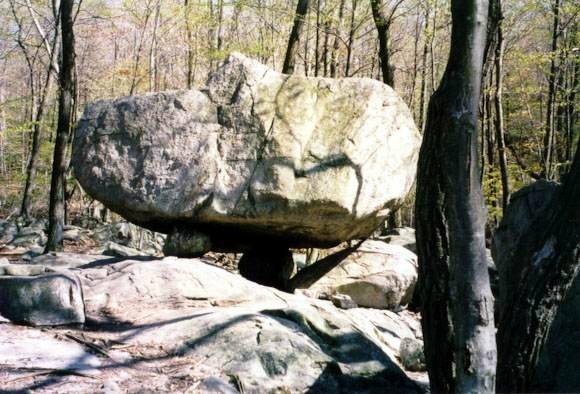 The rock itself is a glaccial erratic, dragged here for a few hundred feet from SDtony Brook Mountain by ice some 12,000 years ago. It also marks the southern edge of the Bear Swamp, a place where every single stinging, biting and flesh eating insect on the East Coast seems to be born. At least that's how it felt to me. The trail turns right, and after a crossing a small bridge, to the right. Soon thereafter, the Blue trail appears, and the worst section of the hike beginns. It is basically a steep climb up, which few people are taking. However, it is rather short, and so you should be done within in ten minutes. The only problem with this climb is, however, that it is right above the swamp and in the way of all those nasty insects. Once on the top, the trail divides. 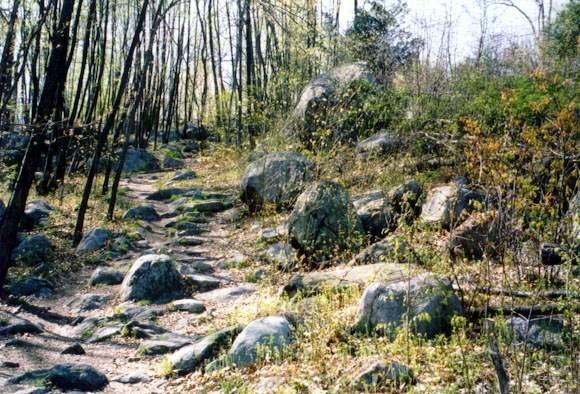 Take the left trail, and soon you will come to the Tripod Rock. 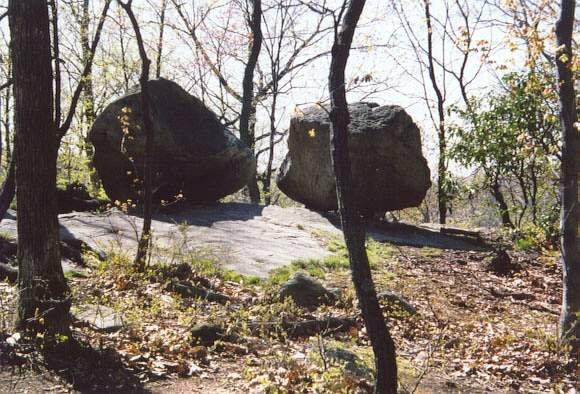 The Tripod Rock is, as the name says, a 10-12 feet tall rock, shaped into a tripod shape. Interestingly, it rests on three small rocks, each in a 3-4 feet in diameter. Supposedly, this has been an ancient Indian calendar site - if you sit on a small stone tongue, you will see the summer solstice sunset through two stones nearby. An ancient calendar site - the Sun sets right between those rocks once a year. Once you've had enough, go back on the Blue trail, and continue straight. 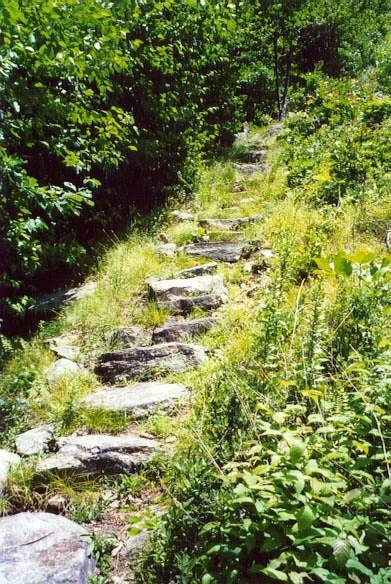 The trail will slope up gently, but otherwise will remain very pleasant with few stones and no undergrowth. Look, however, to a small side trail to your right. If you take it, you will find yourself on a small rocky overhang, facing west, called Lucy's Overlook. Not only it offers some privacy and a decent view, it features one of the most spectacular sunsets you are likely to see in New Jersey. It is a great dating place if you are lucky enough not to meet anybody here. After that, continue down the Blue trail. Soon, the trail will become very rocky and steep. Because of this section, I would advise you not to watch the sunset from Lucy's Overlook - it is dangerous to walk down in only partial or no light. Once you tackle this section, you will end up underneath the powerline tower where you took the White trail. Go down, and you are back at the parking lot. November 15, 2003 - The bridge on the red trail across the stream at the Morgan Place has been taken down, and crossing on the rocks may be treacherous during high water. The bridge at the Bear Rock was taken down as well, and this stream crossing is even more difficult. Both bridges are being rebuilt, but for now you may want to consider alternative hikes. One of many places with great view of the reservior. 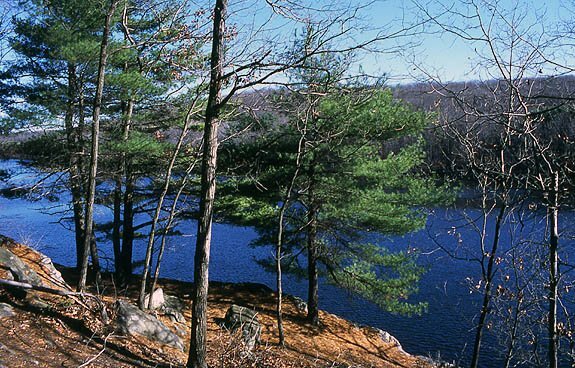 Despite its beauty, the Taylortown Reservoir hike receives much fewer hikers than the Bear Rock hike. Yet, it offers some of the nicest views and a relatively easy terrain for hikers of all ages and conditions. 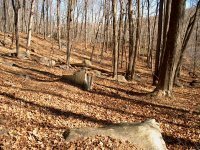 This hike will lead us along the Taylortown Reservoir through a relatively open forest, then to a small, protected vista, after which the hike joins the White Trail to go back, on route of Tripod Rock and the High Mountain vista. Start out on the parking lot, following the blue trail. After you cross a bridge and the subsequent wooden walkway, look right for the Yellow Trail. Many hikers take this trail, but most of them simply want to avoid the steep ascent on route to Tripod Rock. This first section of the hike leads through a relatively open forest. In late fall, when there are no leaves on the trees, you can be easily awed by the steep rocky wall of the High Mountain to your left. On your right, you will see a soccer field and later a small lake. As soon as you pass the lake, the trail forks. The Yellow Trail goes to the left, while the orange trail goes slightly to the right. If you follow the Yellow Trail, you will quickly climb up to the Blue Trail on the top of the hill, through a rather nice gully. However, for now stay on the Orange Trail, and continue slightly downhill. Within five minutes, you will come to the Taylortown Reservoir. For the next half an hour or so, you will stick very close to the reservoir and take numerous breaks, enjoying the sight. Your position will vary - from being right at the waterline to finding yourself fifteen feet above the lake, on a rocky ledge. 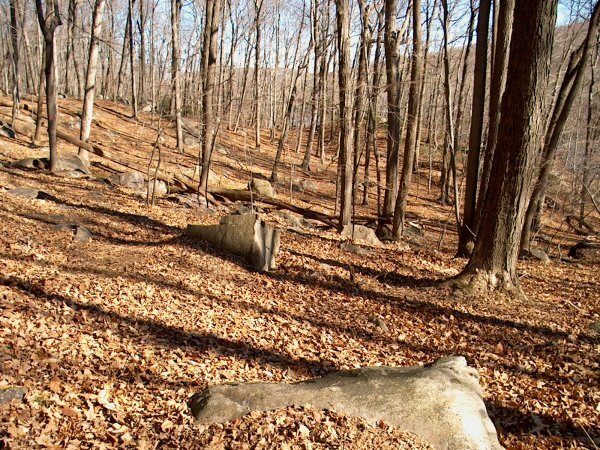 The trail will offer you several great places to rest, including a lovely space under some pine trees and an open bare rock for cold but sunny days. The best time to be here is mid-morning on a winter day when the sun is low and shines across the reservoir. Occasionally, the trail leaves the shoreline for a few minutes, but it is apparent that it's been designed to show you the most of the hike. The forest in late autumn. After you approach a small island in the middle of the lake (if you are patient, this is an excellent spot for taking pictures of ducks next to it), the trail finally leaves the reservoir and starts climbing up in a series of steps. This is as close as you get to difficult hiking here, which is not too much. Soon, the trail levels out and you come to a large flat rock. This is a very nice protected place for a sunny break, but if you want to see around, you better continue on the trail to the net rock, which offers better view. The trail ends almost immediately afterwards, on a T-intersection with the White Trail. Turn left here. After a couple of minutes and a series of turns, the red trail joins you from the right. If you want to complete the really big circle in the park, turn right here and follow my instructions from the previous hike, in reverse order. However, if you want to see Tripod Rock and the High Mountain Vista, continue on the White Trail. After ten minutes in a lovely forest, you will approach the Tripod Rock. From here, please see the conclusion of the previous hike. 40 - 60 min 40 - 60 min The first part of the hike leads you from the parking lot to the vista at the end of the orange trail. The difficulty is very low, but expect numerous breaks to enjoy the view. 40 - 60 min 80 - 120 min Back to the parking lot, the white and blue trails will lead you through the Tripod Rock and some nice vistas, so expect some more breaks. The difficulty is low here as well. Methodology: The lower number is how long it took me to finish each part. While I'm in mid 20s and in a relatively good shape, I tend to stop often to take pictures or simply enjoy the view. It is very likely that your time will be close to mine. The upper limit is my time adjusted to the difficulty of the trail and various distractions. I assumed a family with children in my calculation. I believe that the upper limit is rather extreme. I have not taken into account the time spent for an extended break. The hike into the eastern part of the Pyramid Mountain Natural Historical Area starts the familiar way - take the blue trail by the end of the parking lot, towards the Visitor Center. If the weather is nice, this part of the trail resembles a crowded shopping mall - people everywhere. Right before you hit a small wooden bridge, however, look right for the blue trail - the trail is relatively hard to find, because it is very thin and consists of boulders. Take it and after a minute you will be all alone. This part of the trail is impressive - the sudden withdrawal from all people, combined with a pristine nature creates an eerie atmosphere. Sometimes, the trail resembles a rainforest. Soon, you will cross the main road (Route 511) and begin the 100 Steps trail. The park map will show that the trail leads below a power line, but for the first few hundred yards, you will not notice it. You will walk on a relatively narrow but very level path, with tall fern and relatively young trees creating the perfect tunnel effect. Even though it is hard to get lost here, look for the blue marking on rocks. As soon as you cross something that resembles a rock wall, the real hike up the hill begins. You will climb up about 150 feet within the next 500 feet, mainly on a rocky staircase (that's where the trail name comes from), under the scorching sun. For me, this was the second hardest part of this trail (remember, you'll have to get down to the original elevation somehow), but well worth it. The climb ends near a power line tower, and the view westwards is at least interesting. Continue walking on a now level terrain. Note the raspberry bushes on the both sides on the trail - back home I used to eat them, but there wasn't nearly as much pollution than here. Once you pass the tower, you will see the markings for the beginning of the red trail. However, there is no mark indicating that the trail starts sharply to the left, while an unmarked trail continues straight. So once you pass the markings, make a sharp left turn to get on the red trail. This is the only place you may have some orientation problems, though. Some nasty ascend on this side as well. The red trail now goes back into the forest and slopes very gently upwards. 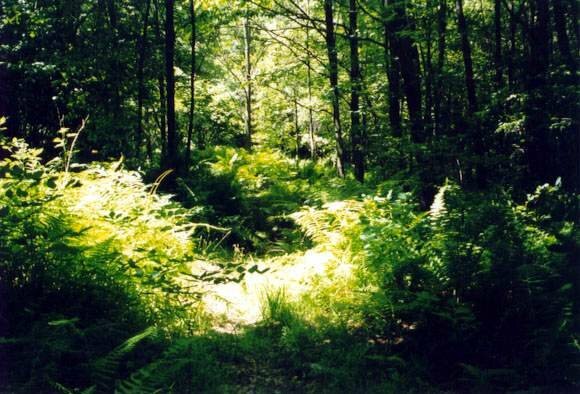 There is very little undergrowth here, and the trail consists mostly of dirt. After the hike, this is a very relaxing part of the walk. Soon, however, the trail turns right (the markings are very good in this area), but continues its gentle upwards trend until it reunites with the unmarked trail you that lead off the main trail when it turned right. At this point, you are standing on the top of Turkey Mountain (elevation 892 feet), the highest hill on this side of the road. It's nothing spectacular, though, as the top is very flat, without any decent overlook. An overlook, however, follows after a few more minutes spent on the red trail. You will come to a few big boulders. Here, watch out where the trail leads - stay on the red trail that goes straight across the top of those boulders. From here, you can spot Manhattan in the distance, as well as spy out Lake Valhalla between the trees, about a mile away and 500 feet down. Now, however, the hardest part of the hike begins. I hope you have sturdy shoes and preferably a walking stick, as the trail descends as rapidly as it went up before, but this time without any stone steps helping out. Here, you will need most of your attention to be directed at where you put your feet, but frankly, there is very little to look at. Once you hit the bottom, you will come across a fork in the trail. The red trail continues to the right, while a green trail goes left. Turn left and keep walking. The green trail is almost level, going around the mountain's summit. As the red trail before, here you will run into virtually no undergrowth and a relatively thin forest - another great relaxing walk after a hard hike. Soon, this trail will lead you to a small brook. The park map indicates that there are waterfalls here and marks them as points of interest. It is true that the brook here has a potential of sporting an impressive waterfall - it runs across large boulders - bout only in the case of a catastrophic meltdown of the snowcaps on the surrounding hills. Otherwise, it is only a small stream. Here, you have two choices. You can backtrack your steps and right before you come back to the green trail turn left onto the yellow trail, or you can cross the bridge and take an unmarked trail to the right. I took the unmarked one, as the yellow trail runs into a small swamp, and it was the middle of the summer. While this unmarked trail has some rugged terrain, including a fallen tree, at the beginning, soon it levels off and offers a very smooth walk. Once you cross a small clearing towards your right, the trail divides - take the right one. Soon, you will come to the edge of Botts Pond. 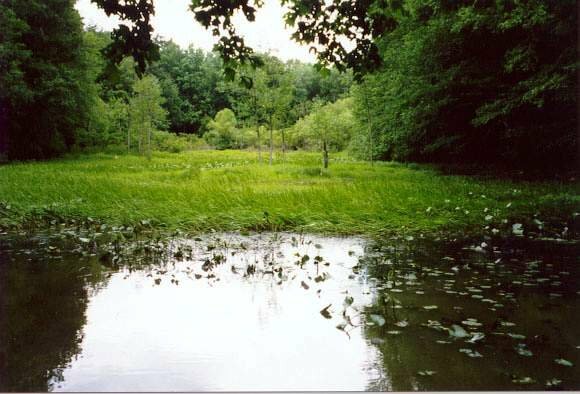 While it is supposed to be a small lake, in fact it is not more than a splash of water, almost completely overgrown by plants. In the middle, there are a few trees where you can spot Woodpeckers sometimes, so if you have the patience and anti-mosquito spray, you can do some bird watching here. Deer tracks on the ground also indicated that this is a popular watering spot. Once you go on, you will come across a small brook. You will have to cross it, but don't do it where the trail leads you. It is rather wide on this spot, with small, permanently wet rocks, which make the crossing dangerous. Instead, head downstream for about 30 feet, where the brook runs under some large boulders. This is a good place to cross, and once you do so, return back to the trail. As soon as you can, turn right and follow the trail along the brook, upstream. Soon, you will come across a fork in the trail, with yellow signs pointing in both directions. Take the left one. From now on, stay on the yellow trail. While it offers a few uphill and downhill hikes, it remains largely flat, and so it is quite popular among families and bikers - you will run into other people here. Once you see the blue trail crossing yours, the yellow trail will flatten up completely and get a gravel surface. Within the next five to ten minutes, you will cross the road once more and end up at the Visitor Center. Overall, this hike features an area very sparsely visited by other hikers. It is a shame that it is not even described in the small map supplement you can get for free, but maybe it is better so. If you want to escape from people, you will have a place to go. Difficulty: 4 out of 10, mainly due to several steep and very rocky sections. Orientation: 8 out of 10. Excellent map, but markings are sometimes missing and signs are old and barely readable. Beauty: 6 out of 10. Basically destroyed by too many people, yet offering some great views. Pyramid Mountain offers a light hike for the whole family. It is not a place to go to be alone, yet it has enough attractions for children. Also, it can offer a nice walk with your partner.